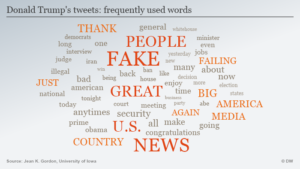 Another President, Donald Trump, has made waves with his use of language as well, as in his re-interpretation of “fake news” to mean any reporting critical of him or his actions, his use of vulgar language to describe African countries, or his habit of using insults and abusive language in his tweets. In an interview with the Deutsche Welle recently, well-known linguist, George Lakoff, commented on Trump’s use of language. Lakoff laments how the wide-spread reporting of the President’s tweets tends to cite the texts. According to Lakoff, just having that language repeated – even if within an article attacking what was said in the tweet – tends, through repetition, to plant Trump’s ideas in our heads. He points out that this is the strategy used by Russia propagandists and the Islamic State in their online messaging. The twitter bots used by Russian hackers repeat tweets over and over again, with slightly different texts, but always using hashtags that support divisiveness in the US population and electorate. This was done in the 2016 election, and is continuing, as in the recent bots’ activity in spreading the #releasethememo hashtag, in reference to the controversial classified memo that some Republicans say shows bias in the FBI’s Trump-Russian probe. This is in an effort to discredit both the FBI and the investigation into the Russian electoral interference, in the desire to undermine the US people’s faith in their government, and thus weaken US democracy. Don’t retweet him and don’t use the language he uses. Use the language that conveys the truth. Truths are complicated. And seasoned reporters in every news outlet know that truths have the following structure: They have a history, a certain structure and if it is an important truth, there is a moral reason why it is important. And you need to tell what that moral reason is, with all its moral consequences. That is what a truth is. He’s not advocating stopping news reports on the tweets, but rather to put them into a proper context, and point to factual discrepancies, when they exist – and in the reporting, to forego inadvertently spreading messaging through textual repetitions. The way that politicians use language can make a big difference in how policies and actions are viewed by the public, especially if a term is repeated frequently. We are seeing that currently in the US in relation to immigration. Trump and Republicans use the term “chain migration“, which has negative connotations rather than the term preferred by Democrats, “family reunification”, which makes the process sound much more positive.